This piece of research was developed in response to requests from hub managers, city policymakers and funders in the UK. It aims to simplify what creative hubs are, their value within the creative and cultural ecosystem, their international potential and how high level stake holders and policy makers can support them. The Creative Economy team been working with hubs for over five years, both in the UK and internationally, developing projects like European Creative Hubs Network and Creative Hub Making Vietnam, as well as developing resources like the Creative HubKit. Authored by Professor Andy Pratt (City University of London), Professor Jon Dovey (University of West of England, REACT, creativeworks, The Watershed) and associates, the report features interviews from a spectrum of creative hubs from across the UK. It focusses on The Fusebox, Roco Creative Co-op, Site Gallery and BOM as working case studies, delving into a variety of business models, symbolic of the wider community of hubs. The report also outlines a template for creative hubs to begin evaluating themselves which, if every hub utilises, provides a compelling picture to high level stakeholders. The research not only outlined the unique nature of hubs within an economy (and society), but also confirmed that a ‘one size fits all’ approach does not apply to these complex ecosystems, they are all as unique as fingerprints, dependent on their community and cultural needs that surround them. 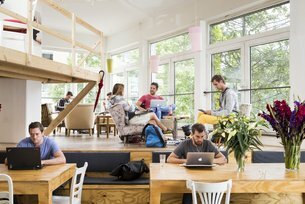 “Our research shows that creative hubs can produce a wide range of impacts including, jobs, new products and services, talent development, regional talent retention, informal education, urban regeneration, research and development, new networks, innovative models of organisation, quality of life enhancements and resilience’. Creative hubs have been popping up across the country and the globe in the last 20 years and have fast become a protective and nurturing infrastructure for creative practitioners and organisations. By supporting hubs, we support the wider creative economy. Calling all European creative hubs - apply now to connect with 100+ hub leaders from across Europe. Glasgow's TAKTAL is 'an agency that initiates the creative use of space'. We talk to Co-Director Helen Teeling about connecting grassroots engagement with strategic regeneration opportunities. ATÖLYE, meaning ‘workshop’ in Turkish is Istanbul’s newest co-working space, “a platform to make, create, and collaborate.” We spoke to designer Bilge Nur Saltık about the story behind their creative community. "We see our role as building a platform from which to shout about the amazing talent this city has hiding in its foothills. "- We speak to Andrea Burns, co-founder of Sheffield's newest creative co-op, about their vision and journey. They've developed a smart fridge, water-saving systems for irrigation and have tackled the drop-out rate in Brazil’s public high-schools, among many other projects. We talk to CESAR, a design firm and consultancy based in Recife, Brazil. Andrew Sleigh, Creative Producer at Lighthouse in Brighton and one of the UK associate producers at Recife: The Playable City programme, talks about the organisation and its new Studio programme. An overview of Britain's first media centre: a champion of independent media creativity and emergent artforms, and our main partner in this year's Recife: The Playable City programme. An overview of Brazil's most successful and innovative digital and cultural cluster - and one of our main partners in the Recife: The Playable City programme.